White can really open up a space but can sometimes look bare. Prevent kitchens from looking dull with vibrant pops of colour, monochrome stripe rugs, and distressed white painted wooden tables. Here, chairs and flowers in accents of orange and fuchsia pink add a burst of life and harmonise the stark, white interiors. Chalky blue is a great neutral and paired with soft whites, rich creams and warm woods can instantly lift your kitchen space, keeping it the right side of country chic. Brick-effect wall tiles, Belfast sinks and industrial-style pendant lights suit pretty much any kitchen look. 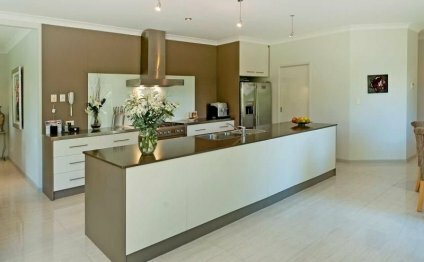 Here they have been used to make this country-style kitchen look more contemporary. The classic country house-style dresser has been updated by being made double-height – which has the bonus of creating extra storage too. White is a classic choice for kitchens as it makes the space feel clean and pulled together. Brighten up all white kitchen islands with pops of colour with crockery and accessories in bold lime greens and vibrant reds to inject some life into the room without spoiling the overall theme. The stainless steel butcher’s hooks will help to bounce light into the room too. Colour phobic but still want to make a statement in your kitchen? Minimalist colour palettes of black and white walls are balanced beautifully here for a smart and modern kitchen interior. A vase of jaunty blooms, quirky hanging lights, and retro kitchen stools will inject colour and texture too. All-white can look sterile. Rustic features, such as this farmhouse-style dining table, and kitchenalia in neutral hues will lend warmth and character. Keep surfaces free from clutter with white wall-to-wall shelving set around the window pane. Well-placed plates, serving bowls, and teacups in cream, pastels and duck egg blue will add a homely feel. Get creative and turn the most awkward of spaces into a clever place to store cookbooks and kitchenalia. Custom made white shelves are a great option for small, urban kitchens, while bumping up the colour in walls, with warming shades of spearmint blue, will add definition and drama. Keeping to a palette of white and grey gives this kitchen a utilitarian feel. Open shelves and wall-mounted rails are a functional storage solution, while allowing pots, pans and kitchenalia to be displayed without the modern feel of wall cabinets.